Looking for a ready-to-go mobile command center? NO LEAD TIME! We have this brand new 36ft. overall length mobile command unit built on a Freightliner M2 chassis with a Cummins 260HP engine and an Allison 2500 automatic transmission. Custom-fabricated aluminum cabinets and bench seating with removable cushions have both been installed inside. A conference room area has been built including a conference room table with a folding leaf for additional table space. The vehicle also has a galley-style kitchen complete with a microwave, coffee maker, and 2.7 cu. ft. refrigerator included in its design. An LDV-built flat-floor slide-out room creates extra interior workspace with the touch of a button. On the exterior, a weatherproof housing for UHD Smart LED TV has been built into the side along with exterior storage compartments. Three ducted low-profile air conditioning units and two Broan wall-mounted heaters help maintain the temperature. A Wrico Platinum 20kW liquid-cooled diesel generator is installed inside a custom-fabricated compartment. Our LDV-exclusive Intel-I-Touch™ vehicle automation system, Quadra Mfg. heavy-duty vehicle leveling system, Zone Defense back-up camera system, and Dometic weather-proof awning are all included on this vehicle. The vehicle has complete emergency lighting and siren packages. A Will-Burt low-profile heavy-duty non-locking telescoping pneumatic mast with a camera is built onto the rear along with a mast lookup light and custom-fabricated plate for the camera. This vehicle would make a great addition to your organization with a much shorter lead time to acquire. 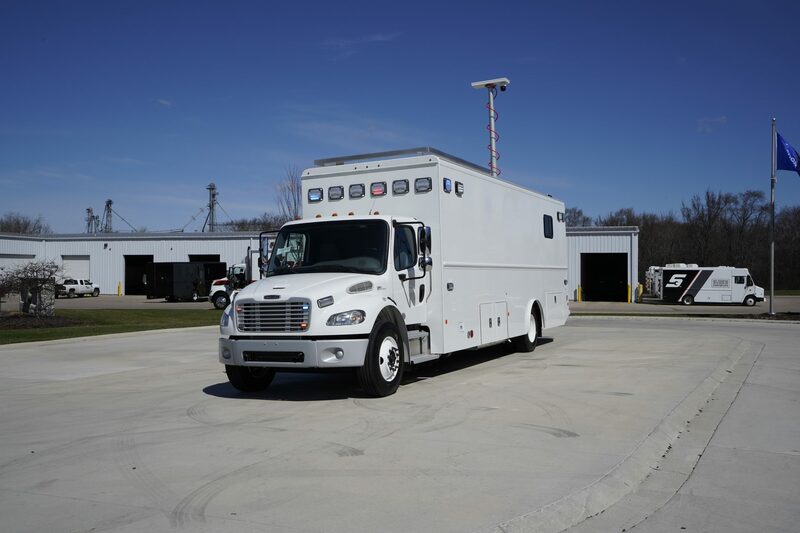 Looking for an in-stock mobile command vehicle? Look no further! Just completed and ready to roll!